A great coach once said, “Don’t ever underestimate the heart of a champion.” For a little over 23 minutes on Saturday night, Anderson Silva’s heart was tested by a man that put his unprecedented middleweight title reign in serious jeopardy. Let’s face the facts, whether you’re a Chael Sonnen fan or not, he had the champ beat. All he had to do was last another 1:50 and ride out a one-sided unanimous decision, but “The Spider” was determined not to let that happen. All night long it seemed as though Silva was trying to pick his shots, but Sonnen willingly ate them and did what he promised he would by taking the champion down time after time. Not only did Sonnen have him looking up at the Oracle Arena ceiling for most of their 5Round affair, he dominated the Brazilian to the tune of multiple 10-8 rounds according to the official judges’ scorecards. “I don’t have any excuses. Chael had a hell of a fight tonight,” an exhausted Silva said after his 7th and most grueling title defense. As the 4thRound began, you could literally see the sense of urgency emerge on Silva’s face as he tried to take it to the man that had taken it to him for the past 15-minutes. Any resemblance of his pinpoint accuracy went out the window, as he tried to tag Sonnen with anything he could muster up before suffering another takedown. Fight he did, and he was going to do it until the final horn blared. 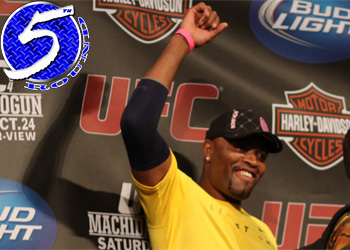 After a long and drawn out championship battle, Silva picked the perfect time to slap on a triangle armbar that forced his unsuspecting challenger to tapout.